An excavation in Bloomington, IL has uncovered traces of a courthouse where Lincoln practiced. Archaeologists are digging at the site before construction begins on a project for the McLean County Museum of History. Producer Chris Ryder is working with the Lincoln Monument Association to film a documentary on Lincoln’s tomb to coincide with the 150th anniversary of the president’s death. You can help fund the project by donating through Indiegogo; a contribution of $25 will get you a copy of the finished film. The Founding Fathers had good reasons for explicitly barring government from inserting itself into matters of religion. But nothing in the Constitution forbids a president from consulting with clerics, and meetings between presidents and religious figures have, on occasion, helped shape history. One such time came when an Episcopal Church bishop traveled to Washington from Minnesota to try to persuade Abraham Lincoln to make wholesale changes in the corrupt and brutal ways the federal government treated Native Americans. The entreaty may well have saved hundreds of Dakota Indians from execution — and the nation from a huge injustice. In 1862, as Lee carried the Civil War into Maryland and Lincoln prepared to turn the struggle for the Union into a battle of liberation, a bloody sideshow played out in Minnesota. Exasperated by broken promises and corruption among traders and federal agents, Dakota Indians launched attacks against settlers and the Lower Sioux Agency, setting off a conflict variously known as the Dakota War, the Sioux Uprising, Little Crow’s War, and a handful of other names. 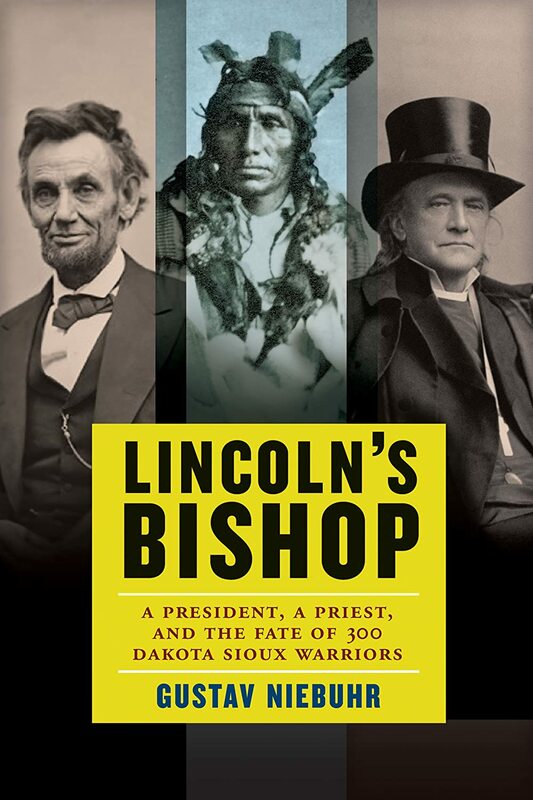 Lincoln’s Bishop: A President, a Priest, and the Fate of 300 Dakota Sioux Warriors by Gustav Niebuhr has joined a relatively short shelf of books devoted to the uprising. The key player in Niebuhr’s account is Henry Whipple, a New York native who became Minnesota’s first Episcopal bishop and an advocate for better treatment of the frontier’s original inhabitants, working to change a system in which Indians were victims of corrupt officials and unscrupulous traders. Whipple’s concern for the Indians was unusual for a nineteenth-century white American, and an especially unpopular position for any resident of Minnesota in 1862 after four Dakota hunters initiated the war by attacking white homesteads and killing five settlers. As often happened in Indian wars over the course of American history from the seventeenth century to the late nineteenth, many whites reacted to the uprising by calling for the extirpation of the Dakota, assuming that all the Indians on the frontier had settlers’ blood on their hands. As Niebuhr shows, the conflict was never so simple, even from its very beginning. Individual Dakota intervened to save the lives of settlers, sometimes because of previous acquaintance and sometimes out of simple humanity. Some whites, too, urged their vengeance-hungry countrymen to differentiate among the Indians, some of whom had converted to Christianity (partly through the efforts of Whipple, who supported Indian missionary efforts) and taken up farming. Whipple was thus the most prominent of a small number of people caught up in a volatile situation who nevertheless refused to engage in the collective demonization of the other that was so prevalent in white-Indian warfare. The bishop wasn’t unsympathetic to the plight of settlers in the uprising’s path—in fact, he helped organize relief for white refugees displaced by the attacks and tend to the wounded—but he considered the Indians’ poor treatment at the hands of the government the ultimate root of the problem. He had been lobbying authorities to reform Indian relations for some time before the revolt, having tried without success to bring President Buchanan’s attention to the problem. Most men would have considered the outbreak of the Dakota War a most inauspicious occasion to persuade Washington of the need for better treatment of Native Americans, but Whipple was undaunted, heading to Washington, D.C. again in 1862 to plead the Indians’ case with Abraham Lincoln. The bishop’s first impressions of Lincoln on the latter’s accession to office had not been favorable. And, as Niebuhr shows in a chapter devoted to Lincoln’s personal history of the Indians, the president wasn’t unaware of the misery marauding Native Americans could unleash. After all, an Indian had murdered Lincoln’s grandfather and namesake in Kentucky. As a young man, Lincoln himself had served in the Black Hawk War; while biographers tend to downplay this period in his life, emphasizing that he saw no combat, Niebuhr points out that Lincoln did witness firsthand some of the devastation of that war during his stint in the militia. But Whipple had a few things working in his favor on his 1862 lobbying trip. The first was Lincoln’s personal tendency toward leniency and mercy. Thirty years before, while a volunteer against Black Hawk, he had intervened to stop vengeful whites from murdering an Indian captive. His tendency toward clemency and compassion remained evident during his presidency, when he routinely spared the lives of condemned soldiers and favored a moderate course in dealing with a conquered South. Like Whipple, Lincoln seemed to have a sort of innate immunity to the urge to dehumanize the other side which is so common in warfare, especially war between different races and cultures. Second, as Niebuhr argues, there was a sense in which the timing of his visit actually worked in Whipple’s favor. The Dakota uprising coincided with a transformation in Lincoln’s thinking about the Civil War. As the Minnesota frontier erupted in violence, the president had determined that more extreme measures were necessary to preserve the Union and was preparing to issue the preliminary Emancipation Proclamation. Lincoln considered slavery a national shame and a cancer in the body of the nation which had finally led to the rebellion; similarly, Whipple referred to mistreatment of the Indians as a great sin which led to the devastation of the Dakota uprising. Thus, for some months before Whipple’s visit, Lincoln’s concerns had been along some of the same lines as the bishop’s. Lincoln proved more receptive to Whipple than his predecessor, giving him access to government records of Dakota relations to help bolster his case. But there was still the matter of Indians captured in the wake of the uprising. A military tribunal sentenced over 300 of them to hang for participation in the war. Despite warnings that failing to execute them all would inflame white opinion on the frontier, Lincoln spared the lives of nearly nine-tenths of the condemned. The result was still the largest public execution in United States history, as thirty-eight Dakota men went to the gallows on December 26, 1862. And it’s important to remember that Lincoln’s record on Indian affairs was not spotless. Biographer David Donald notes that the president remained largely ignorant about Native Americans; like most other nineteenth-century whites, he considered Indians less civilized and more prone to violence than Euro-Americans. Still, Lincoln’s receptivity to Whipple’s pleas for reform and his intervention in the executions are notable examples of Lincoln’s leniency, his aptitude for mercy, and his basic humanity—the traits which have made him one of the most beloved figures in American history. Niebuhr’s book should spark wider interest in this often overlooked aspect of Lincoln’s presidency and bring greater attention to Whipple’s crucial role as a mediator between the government and the Dakota. It’s an enlightening piece of historical research, but also a very inspiring book, a reminder that the forces which Lincoln famously called “the better angels of our nature” can work their magic even in the most violent and divisive of circumstances. Michael Lynch is an incoming doctoral student at the University of Tennessee, a former staff member at LMU’s Abraham Lincoln Library and Museum, and a research fellow for the Abraham Lincoln Institute for the Study of Leadership and Public Policy. You can find him in the blogosphere at pastinthepresent.wordpress.com as well as on Twitter (@mlynch5396). I am filled with deep emotion at finding myself standing here in the place where were collected together the wisdom, the patriotism, the devotion to principle, from which sprang the institutions under which we live.…[A]ll the political sentiments I entertain have been drawn, so far as I have been able to draw them, from the sentiments which originated, and were given to the world from this hall in which we stand. I have never had a feeling politically that did not spring from the sentiments embodied in the Declaration of Independence. I have often pondered over the dangers which were incurred by the men who assembled here and adopted that Declaration of Independence—I have pondered over the toils that were endured by the officers and soldiers of the army, who achieved that Independence. I have often inquired of myself, what great principle or idea it was that kept this Confederacy so long together. It was not the mere matter of the separation of the colonies from the mother land; but something in that Declaration giving liberty, not alone to the people of this country, but hope to the world for all future time. It was that which gave promise that in due time the weights should be lifted from the shoulders of all men, and that all should have an equal chance. This is the sentiment embodied in that Declaration of Independence.